NEWS: Fiji Airways and Etihad Airways has announced a new codeshare agreement. You can book on an Etihad codeshare to Fiji on Air Fiji, and the converse from Fiji to 12 cities in Europe, 17 cities in the Middle East, five cities in Africa, five cities in North America, 29 cities in Asia and three cities in Australia to and from Fiji. Ah, Fiji Airways. The new, boutique airline to whisk you to an island paradise in the middle of the Pacific. Or, depending on your inclination, Oh, Fiji Airways, the small rinky-dink airline with three long-haul aircraft to take you at cut price over the largest ocean via an island that always seems to be recovering from the latest military coup. Offering the paradox of a partial-full service, Fiji Airways is the master of the with-frills-but-paid-for-add-ons. It does at least offer complementary hold luggage, free food (although only a basic wrap or sandwich) and drink (one cup of wine or can of beer). However if you want a more substantial meal on board, you have to pay. 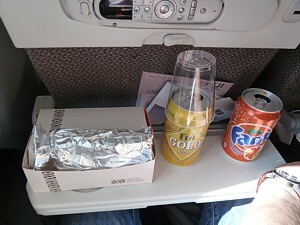 Fiji Airways inflight meals. And it's Fiji Airways in-flight entertainment where things start to get really pricey. Sure - there are free movies, on the large seatback screens. But you only get a small subsection of two or three films and a couple of TV programmes. If you really want to watch more on shorter flights, you have to stump up for the Fiji Airways IFE Bula Bundle. 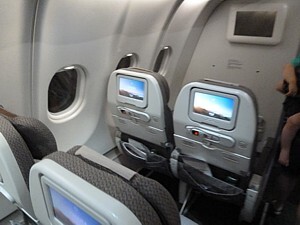 Fiji Airways seatback TV details. 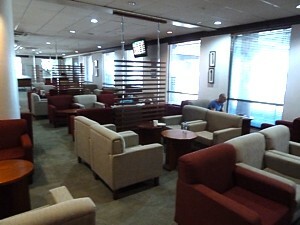 And woe betide you if you have a long layover at the Fiji hub of Nadi, and want to relax in the Fiji Airways Tabua Club. The small box of a lounge in the Nadi Airport basement is OK for an hour before a flight - not for a long stopover. Fiji Airways Business Class Lounges. 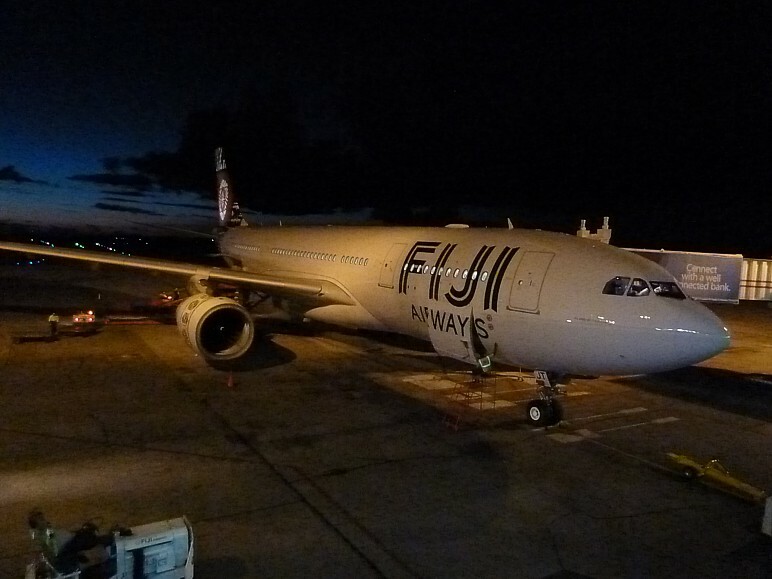 The Airline offers flights to Fiji from the US, China, Australia and New Zealand, using just three long haul A330s as part of a fleet of just seven aircraft. Indeed, from many countries, Fiji Airways is the only possible flights: it's only from Sydney and Seoul is there any choice when it comes to finding a holiday flight to the land of sugar & sun. The three new A330s are heavily utilised to keep this intense service going: any problems can have a massive impact, such as recently when one A330 landed so heavily it badly damaged the undercarriage putting it out of action for weeks, and forcing the cancellation of scores of flights. 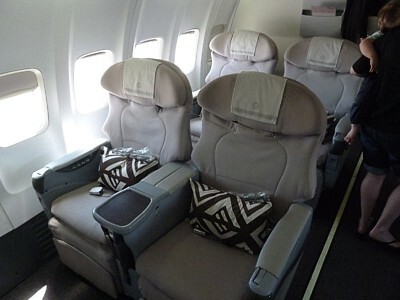 Fiji Airways's seats and cabin. That also brings into play the issue of Fiji Airways staff, who can sometimes not be as helpful as you may light. When your early morning flight from Fiji to Sydney is cancelled and you are put on the evening flight, don't except any announcement or help about it - the best you'll get is a F$20 food voucher. Want another beer? You can ask the crew, and sometimes they will remember. Sometimes they won't. Want to book a seat: the Fiji call centre operates on Fiji Time, and it may take a very long time to get an answer. 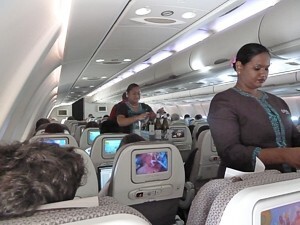 Fiji Airways inflight experience. The one thing that Fiji Airways is not is Air Pacific. For forty years if you wanted to fly to Fiji, you'd be Air Pacific, which was half owned by Qantas, and also run by the Australian Airline. No longer: in 2012 Fiji's military government unilaterally decided to hand control of the airline to Fiji: although denied by the government, it was generally regarded as a nationalisation of the airline. A name change to Fiji Airways soon followed, as did a massive reduction in capacity from Boeing jumbos, to three Airbus A330s. However these long haul Airbus aircraft were at least brand new - and not second hand Ansett machines - and the new branding set the tone for a boutique product. Cutting the big fleet of large planes for a small fleet of mid-sized ones means that many flights are rammed to the gills, not to say overbooked: Never has the advice about getting to the airport early been more important, for if you don't, you might have an extra three day stay in Hong Kong until there is another plane to take you on your way. Fiji Airways routes & destinations. However on board, in Business Class on the A330, the aircraft look superb. There is a lovely new-aircraft smell on the A330s, and the large white leather seats are really good and state of the art. If only the seats had a little more legroom, they would go fully flat. Instead, you're stuck in a decidedly 1980s style Business Class recliner. 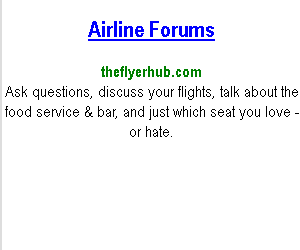 Your reviews of Fiji Airways flights. On the Boeing 737s however Business Class is much more basic with just a large squashy armchair. Mind you, it could be worse - back in economy on the 737s there isn't even such a thing as inflight entertainment, unless you count a short TV programme on the overhead monitor. On the Whole Fiji Airways reviews are middling to OK ish. The airline is certainly not the boutique luxury airline for Savvy passengers in Linen luxury suits it tries to pretend it is. But for basic bucket and spade holidays on the outlying islands it is more than adequate, and indeed better than many airlines around the world. 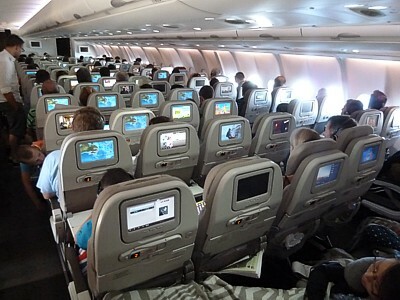 All reviews and opinions on Fiji Airways food, service, seats, planes, upgrades, lounges, and the Frequent Flyer scheme are given as a personal opinion. No legal liability is accepted if you take my advice.